This is the home page for our 18th major research exhibit at the IEEE/ACM Supercomputing conference. The exhibit is again under the title Aggregate.Org / University of Kentucky, the informal research consortium led by our KAOS (Compilers, Hardware Architectures, and Operating Systems) group here at the University of Kentucky's Department of Electrical and Computer Engineering. We are booth #202, to the left in the back portion of the 4th-floor exhibit hall (i.e., find HP, then walk past Argonne, UNM, and SLAC to our exhibit). 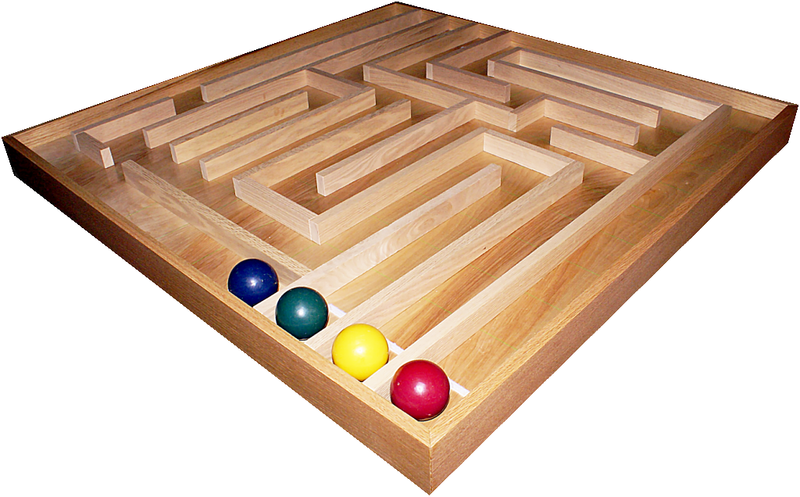 Although our exhibit this year will look a bit different (due to squeezing into 15'x20' because of the smaller exhibit hall), we'll still have that wooden maze with the four colored balls in it. Each of the colored balls has a different path to take (MIMD), yet it is perfectly feasible to get all the balls to their respective destinations by a series of tilts of the table (SIMD). Yes, you really can execute MIMD code on SIMD hardware with good efficiency... Click on the maze above for a ~50MB video showing the maze in action. Fundamentally, this is what our latest software does for GPUs (Graphics Processing Units). Specifically, it can take shared-memory MIMD code written in C and efficiently execute it on an NVIDIA CUDA GPU or OpenCL target (including AMD GPUs). Why do this? GPUs thus far have not had stable, portable, programming support for general-purpose use, so there is virtually no code base for supercomputing applications. Our technology allows codes written for popular cluster and SMP target models to be used directly. New for SC10, we rewrote the system to make the output of standard MIPS compilers, especially GCC, able to run on GPUs, thus supporting a wide range of fully-featured languages. Last year's alpha test release version 20101122 is freely available as source code at http://aggregate.org/MOG/20101122/. Akshay Vummannagari, Verilog And FPGA Prototype Of A Nanocontroller System (PDF), May, 2010. Muthulakshmi Muthukumarasamy, Extraction And Prediction Of System Properties Using Variable-N-Gram Modeling And Compressive Hashing (PDF), 2010. Shashi Deepa Arcot, Genetic Algorithm Controlled Common Subexpression Elimination For Spill-Free Register Allocation (PDF), University of Kentucky MSEE Thesis, December, 2009. Nien Yi Lim, Separating Instruction Fetches From Memory Accesses: ILAR (Instruction Line Associative Registers) (PDF), November, 2009. Diego A. Rivera Polanco, Collective Communication and Barrier Synchronization on NVIDIA CUDA GPUs (PDF), University of Kentucky MSEE Thesis, September, 2009. Bobby Dalton Young, MPI Within A GPU (PDF), University of Kentucky MSEE Thesis, http://hdl.handle.net/10225/1085, July, 2009. Soohong P. Kim, Chip Multiprocessors with On-Chip Aggregate Function Network, Purdue University PhD Dissertation, (unofficial local PDF copy pending Purdue posting), August, 2009. Akil Kaveti, HDL Implementation and Analysis of a Residual Register for a Floating-Point Arithmetic Unit (PDF), University of Kentucky MSEE Thesis, http://hdl.handle.net/10225/893, 2008. Sarojini Priyadarshini Rajachidambaram, Kentucky's Adapter for Parallel Execution and Rapid Synchronization , University of Kentucky MS Thesis, http://hdl.handle.net/10225/709, 2007. Swetha Mitta, Kentucky's Adapter for Parallel Execution and Rapid Synchronization , University of Kentucky MSEE Thesis, http://hdl.handle.net/10225/621, 2007. Chenxing Wang, Dynamic Voltage Scaling for Priority-Driven Scheduled Distributed Real-Time Systems , University of Kentucky PhD Dissertation, http://hdl.handle.net/10225/747, 2007. Timothy Ian Mattox, Exploiting Sparseness of Communication Patterns for the Design of Networks in Massively Parallel Supercomputers (PDF), University of Kentucky PhD Dissertation, http://hdl.handle.net/10225/280, 2006. Krishna Melarkode, Line Associative Registers (PDF) University of Kentucky MSEE Thesis, http://hdl.handle.net/10225/255, 2004. We also shot a movie from a Canon PowerShot running a CHDK motion-detection time-lapse script. It was intended to be a live feed, but it was unable to consistently send images via an Eye-Fi card thanks to SC's flakey wireless . Here is that movie in 1080 24FPS format; however, it is also more flexibly available from our YouTube Channel.